This week Joe continued his study of playing the difficult F harp by transcribing the Junior Wells' classic, "Messin' With The Kid". The transcription (here) includes the Vanguard Records solo to challenge your F harp playing, the bass/horn line, and of course the hook, which he transcribed for both second and third position. Having this song in your repertoire is a must! Southwest Liaison Of the Filisko Method Checks In! Between teaching the Filisko Method and smoking cigars, our own Big Jim Themelis finds time to catch the important gigs in Phoenix. 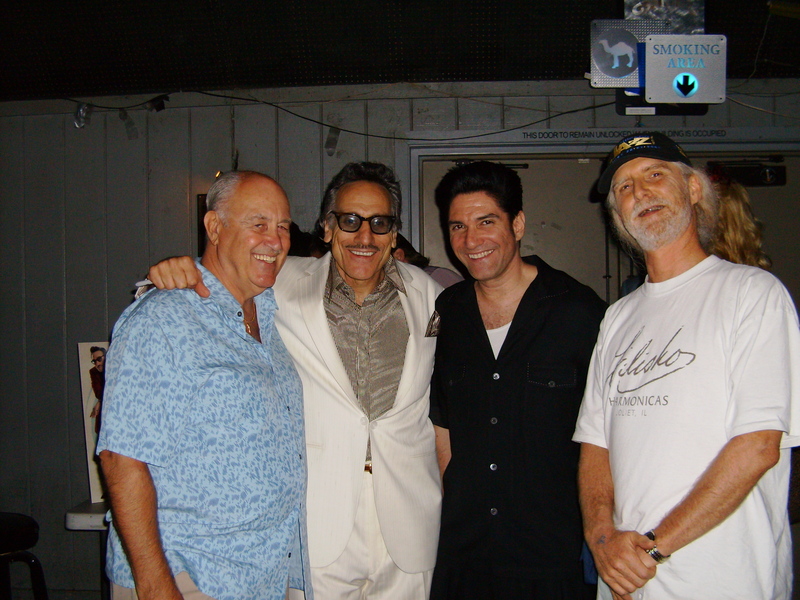 Here Jim is hobnobbing with Rick Estrin, Bob Corritore, and drummer/former Chicago resident, Frank Rossi (left). If you missed Tad Robinson the last time he was in town, get out and see his show this week at Buddy Guy's Legends, Thursday, August 13. Tad is a phenomenal vocalist, bandleader and harp player doing R&B, soul and blues. Great show not to be missed! New Release From Doug Deming! B1 Friend and guitar player Doug Deming has just released his second CD, Falling Through the Cracks. This disc features harp players Kim Wilson and Dennis Gruenling. You've seen Doug in town gigging with both of these harp players in the past -- now get your hands on his CD here. NO CLASS THE NEXT TWO WEEKS! The Old Town School has summer break and the current class session is over. Be sure to register NOW for the next session so the school knows there are enough people for the classes. See you in the B1 Blues Room again on August 31. Use the free time to work on your talking blues song.